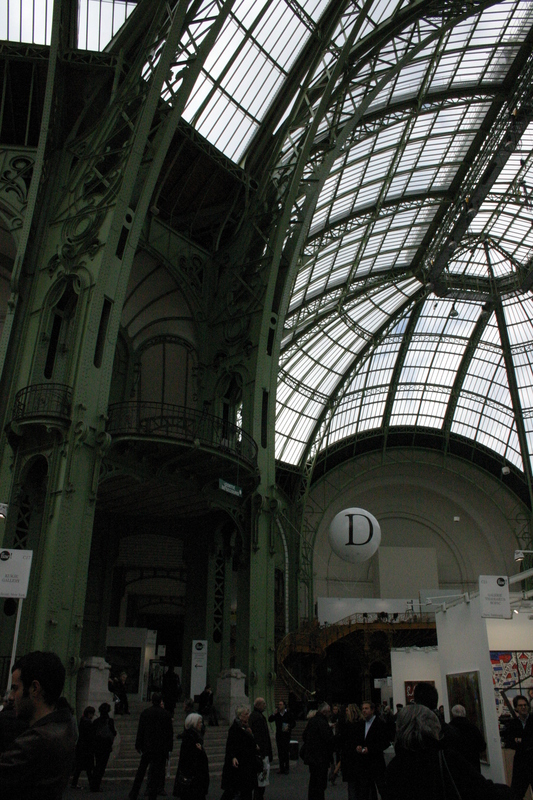 The fair is being held in two places, the Grand Palais (built in 1889 as an exhibition hall, its not a palace) and the court of the old section of the Louvre. The Grand Palace seems to be for the bigger, international galleries such as the Gagosian, Michael Werner and the Marian Goodman (where i saw the Kentridge Video). The Louvre court was for smaller galleries. Before i talk about the art, i have to tell about the people. I might have had a permanent smile on my mug, because this was PRECIOUS. It was very easy to spot the self-important gallerists and people who were, or pretended to be the collectors and “knowlegables”. That know-all, chin up swagger, intense discussions with the eye flickering away every now-and then, just to check if someone important is passing by. Dressed to kill, or in anyway to impress. I caught one lady who was dressed as a walking art work, maybe to catch the eye of a gallery? I took a few pictures of the people, not very difficult, everyone was taking pictures! I want to say, i heard a lot of American-French, as always loud, so this was definitely the American venue. The atmosphere at the Louvre was much more relaxed. ART – this is art with capital letters. well ……. 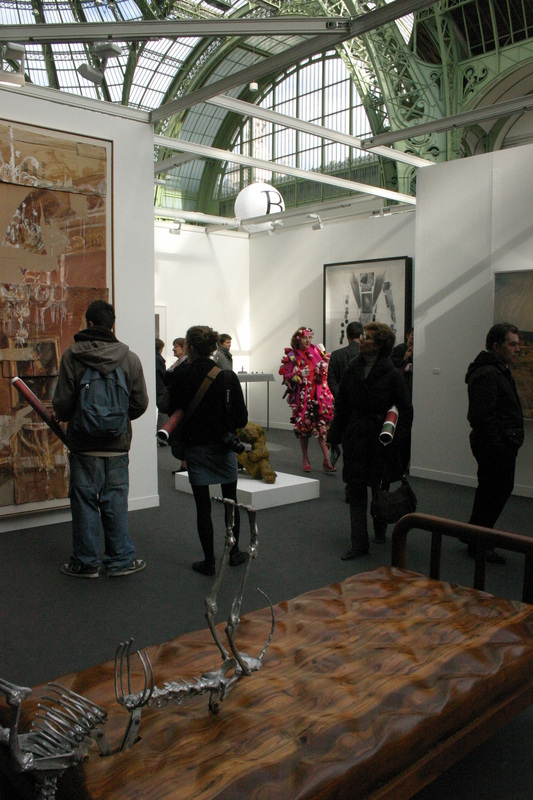 the best was seing Kentridge and Kendell Geers represented, but also that not one type of artwork dominated the show. 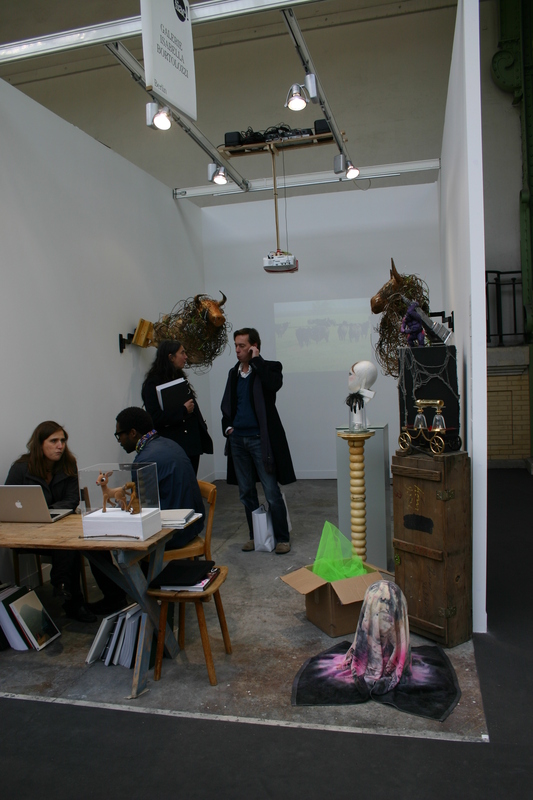 There was everything from abstract (rubbish, my word) to conceptual and exquisitely executed artworks. I am going to give just a few artists that were new to me, and seemed worth looking up on the internet. Kendel Geers, South African now living in Belgium. He is best known for his conceptual pieces, had a show at the Pompidou in 2001 wen i was here last. 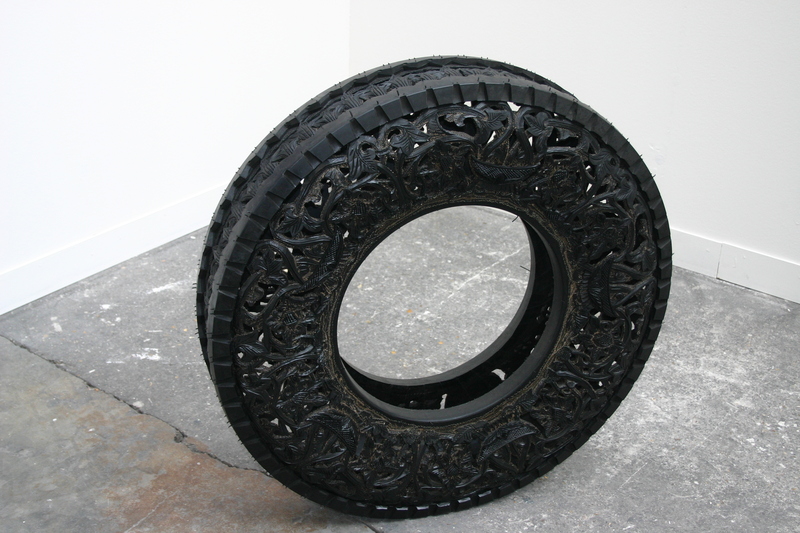 At the fair he showed a collection of small sculptures grouped together as one, and a large black tire (see photograph) intricately carved. I saw some beautiful woorcuts by Kentridge in George some years ago, so it is not impossible that these works by Geers represent his bread-and-butter pieces, but then, as we all know, artists do not make their own works any more, they conceptualize, and some fool of an artisan makes the actual work. Which means that Kendell actually means something else by cutting up a tire. Something useful into something decorative?? ALIGHIERO E BOETHI – huge embroidered canvasses. The gallery included some drawings too, so this time we can see where the artist is going. The embroidery is a natural extension of his mind-set. I found his work mesmerizing. DMITRI GUTOV Russian. He makes line-drawings of his subject first, in this case two of Rembrandt’s paintings. 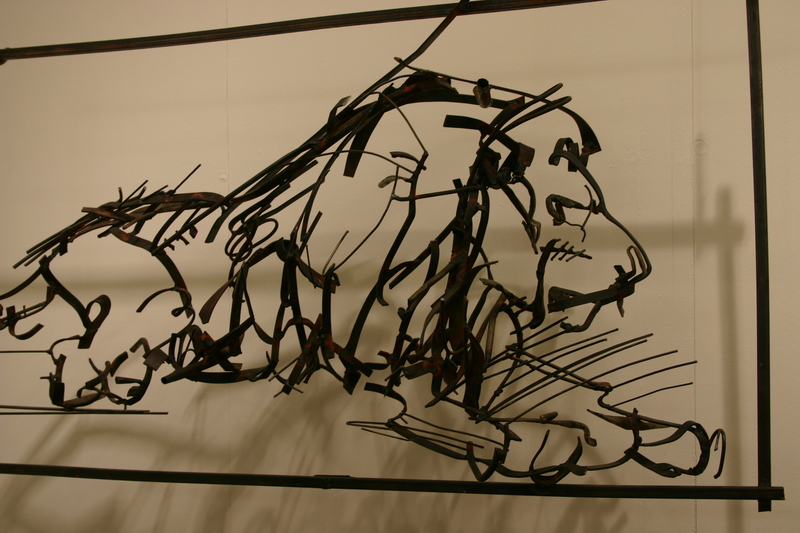 He then translates the lines into 3D sculptures welded together to follow the lines. See photo. CIPRIAN GAILLARD This is good video. He is one of the nominees for the 2010 Marcel Duchamp prize. His main theme is how communities are transformed and displaced by industrialization. In this video he shows and old WW2 bunker being excavated, and then re-buried in sand. The process is carefully and very interestingly filmed, and treats a contemporary ruin the same as an ancient one all gone and forgotten. No squeaky music and weird angles with ad-nausea repeats, he has a very good message to bring over. It has taken me all morning to write this, i hope you have a minute to read it. Love die line sketch aan die einde. Hehe mams moes seker lekker gelag het vir die hooiiii pelooooi hehe, niks soos die art community uit om te impress nie 🙂 dit trek gewoontlik meer net mens se aandag van die actual art af, mmmmm maby moet iemand n exibition he, waar die peeps die exhibition is, they will LOVE IT, Merci madam. Geers se buiteband is baie interesant en nice. Ek vind ook die ‘Bambi’ (?) beeltjie in die een foto interesant en Gaillard se video is waardevolle inligting, dankie. Ek was toe by die Cinema Francais. Blond, Brown gesien, dis baie snaaks. Dis interesant dat jy die abstrakte kuns trash noem… ons het juis gepraat dat abstrakte kuns nie juis in SA ‘n mark het nie. Shoe ek wens ek kon hierdie sien. Net weereens besef ‘n foto van sulke werk is net nie voldoende om die ware gevoel te kry en die tegniek te waardeer nie. Tyre is beautiful. The lion looks a bit Kentridgey?